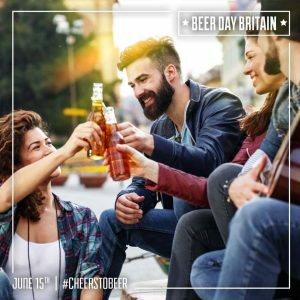 Sing Cheers to Beer, the Anthem to Beer with Beer Day Britain! Are you ready to prove that Beer Day Britain’s got talent? Are you a member of the top pub singing team in the land? Be part of the group that sings the most enthusiastic rendition of the beer anthem ‘Cheers To Beer’ during the National Cheers To Beer at 7pm on June 15th. To enter the contest please download the Cheers To Beer karaoke backing track, lyrics, and musical score by clicking here and then do lots of practice at the pub. On Beer Day Britain June 15th please post a video link of your group singing the anthem on Twitter and copy @BeerDayBritain using the hashtag #CheersToBeer. The winning team will be announced in the days after Beer Day Britain. The prize is everlasting glory and a certificate to recognise your sterling achievement. Singing together has proven health benefits. Beer also has health benefits and drinking it in the pub is good for well-being. Combine the two and the result is happiness all round!